The Notice to Employees about Applying for Unemployment Benefits is an unemployment law poster by the Wisconsin Department Of Workforce Development. 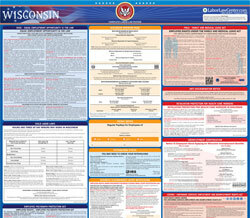 This poster is mandatory for some employers, including all employers covered by wisconsin's unemployment insurance law. This poster must be posted in a conspicuous place by all employers so employees can see it. This poster describes how to qualify for unemployment and what information is needed to apply. It appears you don't have a PDF plugin for this browser. Please see the link below to download wisconsin-ucb-7-p.pdf. alternate format, including translated to another language. name and address in the box (at right) for employee reference. social security number, we cannot take	 your claim. apply the first week you are unemployed. Do not wait until the week is over.